The UN Security Council has approved an investigation into reports of massive corruption in the UN-administered oil-for-food programme in Iraq. 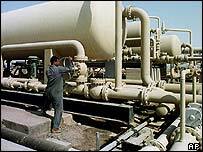 The now-defunct scheme was designed to help Iraq buy humanitarian goods and ease the impact of sanctions. But an adviser to the Iraqi Governing Council told the BBC that it allowed Saddam Hussein to buy influence abroad. He said the former Iraqi leader spent billions of dollars bribing foreign businesses, journalists and officials. "The oil-for-food programme provided Saddam Hussein with a convenient vehicle through which he bought support internationally," Claude Hankes-Drielsma, a British adviser to the US-backed Governing Council, told the BBC's Today Programme. Mr Hankes-Drielsma quoted a recent report by the US Treasury, estimating that $10bn of illicit gains were made from the oil-for-food scheme. One leading source of cash, he said, was a 10% mark-up on every invoice under the scheme, Mr Hankes-Drielsma said. He told the BBC that he discovered the extent of the abuse while going through documents in Baghdad. "I was shocked to the core," he said. "I was so shocked that I left the room. It took me about 15 minutes to recover. "Significant amounts went to buy influence, to make sure that countries were indebted to Saddam Hussein and his regime," Mr Hankes-Drielsma said. The former Iraqi leader managed to do this "under aegis of the UN", he added. The Security Council welcomed a wide-ranging inquiry proposed by UN Secretary General Kofi Annan, and called for all governments to co-operate. But Mr Hankes-Drielsma said some countries on the council had benefited from the bribes and were "part of the problem". Launched in 1996, the oil-for-food programme was the largest humanitarian operation ever undertaken by the UN and was meant to help civilians. Recent media reports have accused individuals and companies from more than 40 countries, including a senior UN official, of being involved in corruption and bribery in connection with the oil sales. BBC UN correspondent Suzy Price says the allegations come at a sensitive time for the organisation, which is involved in mapping out Iraq's political future. Former UN humanitarian coordinator in Iraq Hans von Sponeck said the allegations needed to be cleared up, but denied that the world body was closely involved in corruption. "The major part of the transactions where graft, misuse [and] kickbacks were involved by-passed United Nations officials," he told the Today programme. He said these transactions were extremely complex, and negotiated between the Iraqi government and suppliers. However, he added, they were cleared by UN headquarters, and the inquiry was needed to avoid a "politicised mudslinging game". The head of the investigative panel, former US Federal Reserve chairman Paul Volcker, said the priority would be to deal with allegations of corruption within the UN itself. "You can't sit on this and let it fester. You've got to get it investigated and... if it shows something bad in the UN, clean it up." He did not put a time frame on the inquiry but promised an update in three months. "The former regime is the main suspect"